Working in the yearbook field, we’ve seen our fair share of beautifully designed books… and we’ve also seen our fair share of less than laudable designs. There are a number of common design pitfalls that crop up from time to time, and we thought it was high time to address the best solutions for each. It happens every year. At least one student was absent for school pictures or just didn’t have them taken and now there’s a blank space where their photo is supposed to go in the yearbook. So, what do you do? It’s easy to replace the empty spot with a stock clip art image that you’ve had in a folder since 2003. It’s convenient, easy to find, and often free. You assume that just one piece of clip art won’t hurt. After all, something looks better than nothing, right? And no one will even notice it anyway, right? Not exactly. Clip art is a big no-no if you want your yearbook design to be taken seriously. It’s considered unsightly, distracting, and amateurish. It also takes away from the cohesion of the page. In other words: Just say no to the clip art. Contact the child’s parents to ask for a clear headshot to use. Chances are they have plenty. Track the student down and request to take a headshot for the yearbook. Search through your existing cache of photos to find a suitable replacement. Sticking to a good yearbook theme can be challenging. Sometimes you have rogue pages that just don’t seem to work with anything else and other times you might develop new ideas that don’t exactly fit but you think they’re too great to cut. But a cohesive theme is what takes all of those amazing, well-crafted ideas that you worked so hard on and wraps them all up in a neat bow to showcase to the world. Or, at least, the student body. Stick to your theme no matter what. Sometimes that’s going to mean cutting out something that you really love. Every designer hates the editing process, but it has to be done. If you’re having trouble with the editing process or letting go of something that you are particularly attached to, save the idea for next year when you can think of a way to incorporate a theme that works well with it. Create a style guide before starting your yearbook including theme, margins, and color schemes, and always keep it on hand for easy reference. Photos are the star of the yearbook show. Great images can make a decent yearbook great, while bad photos can make a really good yearbook seem rather tepid. But you don’t have to be Ansel Adams in order to get some great photos and they don’t have to qualify for the cover of TIME magazine. What you do need are interesting subjects, good composition, and good quality. It’s not nearly as hard as some people think it is. Read up on our super simple tips for taking professional shots for those with little to no experience. And remember the clip art debacle? It applies across the entire yearbook, not just in replacement images. Keep the art on your pages interesting and your entire yearbook will reflect that. It doesn’t matter how great your photo is, if the image file is low-resolution, it’s not going to print well and will ruin your page. Make sure your photos are the largest sizes with the most megapixels as possible, and always be sure to save your files at least a 72dpi. Ahh, the gutter. It can be the bane (or spine) of a yearbook designer’s existence and has undoubtedly caused hours of frustration and do-overs. When placing a photo across two pages, the inside 0.25 inches on both pages will be distorted. This will create a problem with about half of an inch in the center of your image. This is especially troublesome when you’re using a picture of a face. When a face goes into the gutter, it completely ruins the photo and, by default, the entire page. Avoid placing photos with faces anywhere near the gutter to better avoid these problems in the first place. If you’re putting portraits across the spine, make sure that the faces fall on the far sides of either end of the photo rather than towards the center. Proper margins make a huge difference to the look of a page layout. Keep them consistent throughout your yearbook and always make sure you have your settings right before starting your page to avoid having to start over. For anyone not sure of how to properly set their margins, the average sizes are .50” and .75”. Typography matters! Don’t visually overwhelm with too many fonts. We’ve covered the importance of keeping it simple with your font choices. Try to avoid using too many of those novelty fancy fonts and, most importantly, don’t use too many different fonts on one page. A good rule of thumb to follow is to use one font for your headers and a complimentary, readable font for your copy, and that’s it. Keeping your photos properly aligned is as important in your design as anything else. If you’re resizing an image to fit in your template, that’s fine, but always check to see that proportions are constrained while doing so. Don’t try to stretch a portrait photo to fit a landscape template and vice versa. This creates a distorted image that will stick out terribly on your page and probably ruin a perfectly good photo. Images all set to the same size on a page just makes everything look flat and boring. Layering images of all different sizes draws the eye all around the page and creates visual interest. Keeping your headers and footers consistent on every page might not seem important to a beginner, but it is. 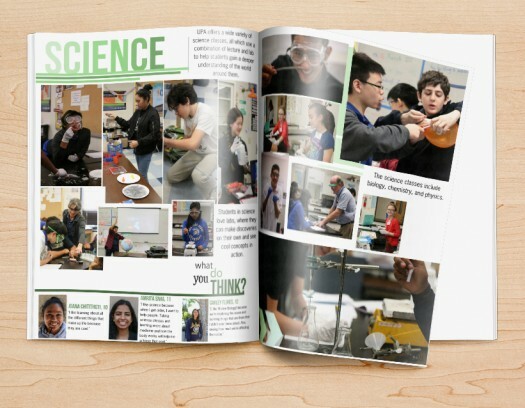 It creates a good flow throughout your pages and will give your yearbook a professional look. Stick to pre-made templates, like the ones provided by TreeRing, if you’re not quite confident yet in your growing design abilities.